This was an awesome dinner, and the leftovers were great too! Bring the water and quinoa to a boil in a pot. Cover, reduce heat to low, and simmer 20 minutes. 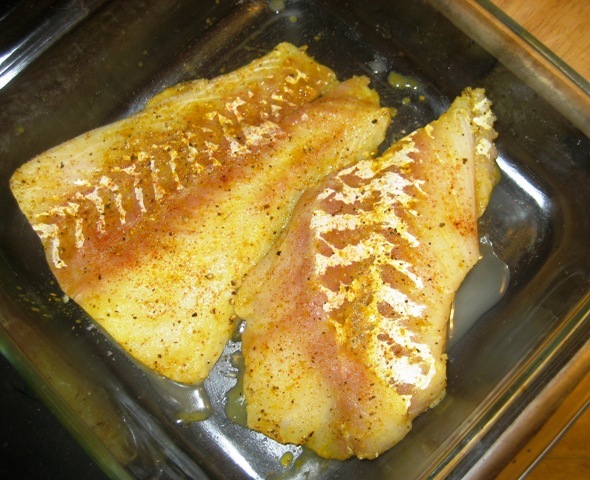 Mix the fish with lemon juice and about 2 teaspoons curry powder and a sprinkle of chili powder if you like. The fish is ready for the oven. Place the fish in an oiled glass baking dish and bake at 350 for about 30 min, check after 20, it’s done when it flakes easily. Heat the oil in a skillet over medium-high heat. Stir in the onion, garlic and carrot pieces and cook 1 minute. Mix in curry powder, chili powder, turmeric, cumin, salt, and pepper. Ready to add the cornstarch and reserve coconut milk. 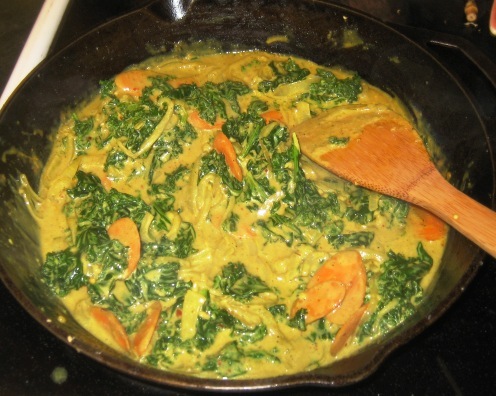 Mix in the vegetables (you can use other greens, snow peas, regular peas, ect.) and then add the coconut milk. Cook until vegetables are tender. Add the coconut and cornstarch mixture to skillet to thicken sauce. 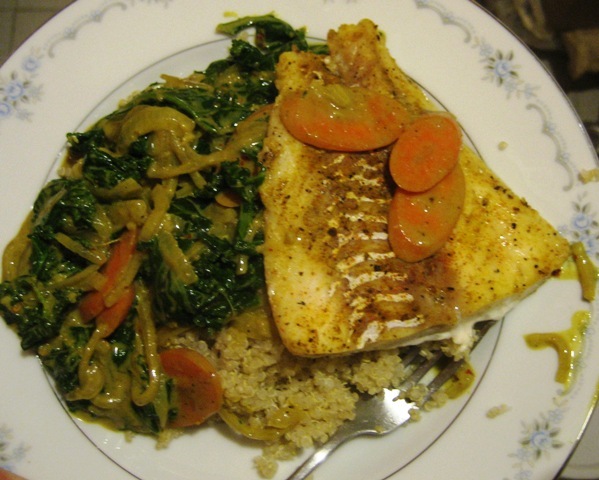 Serve over the baked fish and the quinoa. You can find the original recipe here on AllRecipes.com. This meal took me about 30 minutes to make. If I had used a whole pound of fish it would make 4 servings. I used about 2/3 of a pound and had a small portion of leftovers, yum! Previous Dana’s Frittata with Greens and Chilies Next What to do with all those leeks….